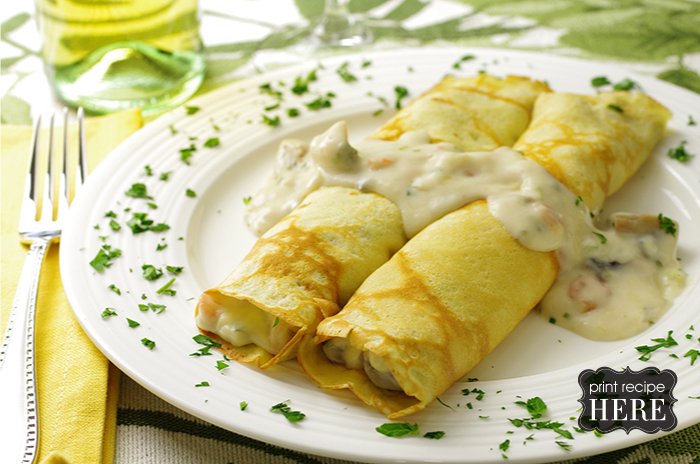 Reminiscent of the dish first experienced at the Magic Pan restaurants in the 1970s, these crepes are filled with a seafood and mushroom mixture and a béchamel sauce featuring Gruyère cheese. They make a delightful entrée. 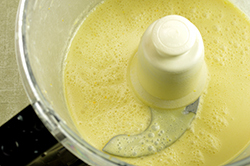 To Make the Crepes: In a food processor or blender, mix the eggs, milk, salt, and sugar together, blending thoroughly. Add the melted butter and blend again. Add the flour to the mixture and mix until just combined; do not over mix. 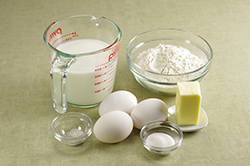 Pour the batter into a 4-cup glass measuring glass or a glass bowl, and cover tightly. Place in the refrigerator for at least 2 hours, and preferably longer, up to 1 day. 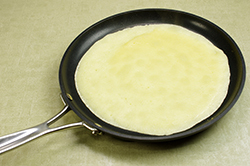 When ready to make the crepes, heat a crepe pan, or nonstick skillet over medium heat. Swipe the cooking surface with an oil-soaked paper towel. Pour 2-3 tablespoons of batter (more or less depending on the skillet and size of crepes being made) on to the hot skillet and immediately swirl the batter to coat the surface. Pour off any excess batter, if necessary. The batter will quickly set and the top will become dry-looking. Loosen the edges of the crepe and check the bottom for brownness;,about 1-2 minutes. Flip the crepe and cook the other side for about 30 seconds. 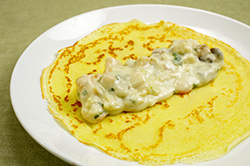 Remove the finished crepe from the pan and place on a waiting dinner plate. Crepes may be stacked as they are removed from the griddle. 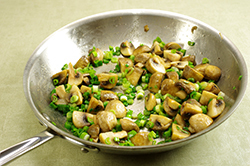 To Make the Filling: In a skillet, melt 2 tablespoons of butter, add the quartered mushrooms and sauté until the mushrooms are tender, about 4-5 minutes. Add the sliced scallions and sauté an additional minute. Add the shrimp and quartered scallops, and sauté for one minute. Add the dry white wine and allow to simmer for 1-2 minutes. Remove from heat and set aside. 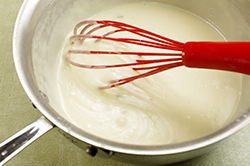 Meanwhile, in a saucepan, make the béchamel sauce base by melting 4 tablespoons of butter until bubbly. Add all at once, 4 tablespoons of flour and whisk vigorously together. 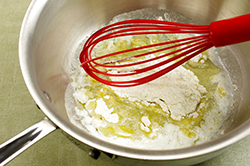 While continually stirring, allow the roux to cook and the flavors to develop for 2 minutes. Add the milk and continue to whisk. 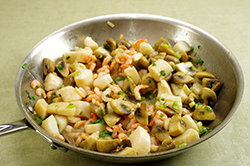 Once incorporated, add the chicken stock, and any pan juices from the seafood mixture. Whisk the sauce until smooth and thickened. Season with salt and pepper to taste. 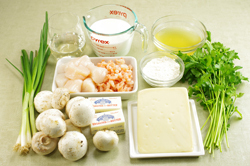 Add the mushroom and seafood mixture to the béchamel sauce and stir to combine. Add three-fourths of the grated cheese (6 ounces) and stir to melt the cheese and incorporate it into the sauce. 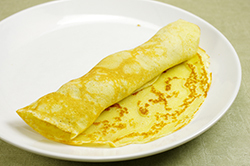 To Assemble the Crepes: Place approximately 1/3 cup of the filling in a line at the center of each crepe. 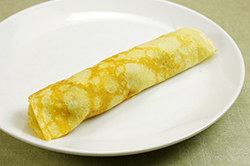 Roll and fold the crepe into cylinder. 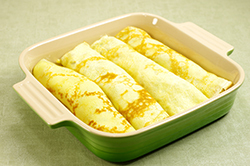 At this point, the filled crepes may be plated and served with a dollop of sauce on top and a garnish of chopped parsley, or the filled crepes may be placed in a casserole, sprinkled with the remaining 2 ounces of cheese, and baked for 30 minutes until heated through thoroughly and the topping cheese nicely melted and browned.